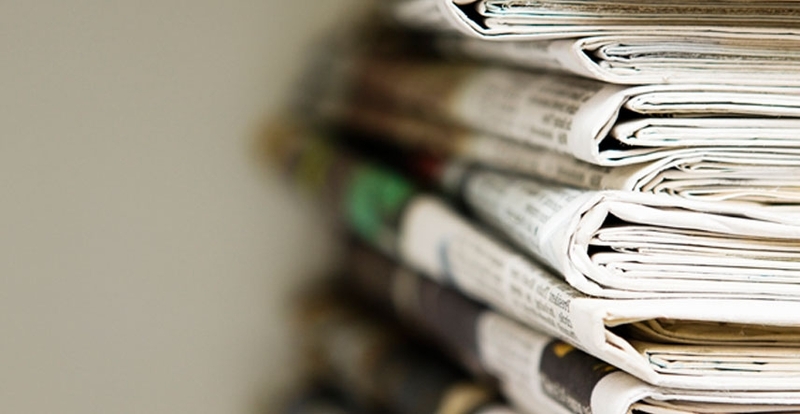 Besides acquiring and expanding access to information and communication technologies (ICT), countries must also evaluate and strengthen their capacity to use such tools, according to a new study by the Inter-American Development Bank (IDB). 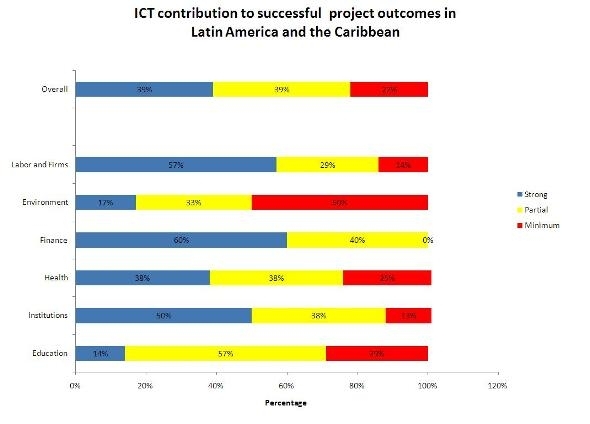 Latin America and the Caribbean need to improve the skills of their populations, the physical infrastructure as well as institutions and regulations so ICT can have a positive impact on development, the study concludes. 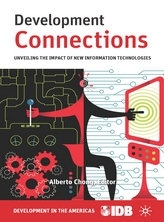 The book Development Connections: Unveiling the Impact of New Information Technologies analyzes how ICT contributed to the success of 46 development projects in Latin America and the Caribbean in six different areas: finance, health, institutions, education, poverty and the environment. The study is the first in the region to systematically apply strict statistical methods to measure how technologies affected project outcomes. Through randomized control trials and econometric studies, researchers found that at least 39 percent of the projects in the sample benefitted strongly from the adoption of new technologies while the remaining 61 percent benefitted only partially from employing ICT. Source: Author's calculations based on randomized control trials and econometric studies conducted in 46 projects in six sectors in Latin America and the Caribbean. The trials show that in order for ICT to contribute to development it is necessary to take into account equally crucial elements, such as human capital, the institutional context, and the policy goals of governments. The findings come as Latin American and Caribbean policymakers, seeking to narrow the digital divide that separates their countries from more developed nations, hope to boost investment in hardware and software to increase access to the latest ICT. The study recommends that governments focus their efforts on the use of technology as well as on access. When designing policies, they must be sensible and consonant with national realities, taking into account the shortcomings, potential cost and benefits of adopting a given technology and opportunity costs. The study warns that, in many cases, adopting the latest technology will not necessarily generate the best development outcome if, for example, the population lacks the basic literacy skills to use such technology properly. The study calls for countries to invest in infrastructure, regulation and human capital to improve their capacity to benefit from greater access to technology. It recommends that governments systematically evaluate the impact of ICT on projects and scale up projects to reduce investment costs, particularly when they involve the development of specific software. The book is part of the series Development in the Americas, the IDB’s flagship publication, which every year analyzes key development issues facing Latin America and the Caribbean. Finance: The study shows ICT can help promote financial inclusion in Latin America and the Caribbean. However, up to now, this region has lagged the rest of the developing world in benefitting from these technologies. Its poorest households cannot afford computers or Internet service. Regulatory barriers limit provision of mobile banking services and banks have had trouble defining a sustainable business model for small payments. Uncertainties related to regulatory frameworks and a lack of sufficiently reliable nonbank correspondents curtail investment in new technologies to improve financial inclusion. Health: The application of ICT tools in health care shows high potential to improve services, cost-effectiveness, and health outcomes in the region. A large-scale implementation, however, would be too costly and ineffective. At this stage, one of the priorities is piloting and implementing more comprehensive ICT-related health interventions for chronic care. Telemedicine has been implemented with relative success and seems to be a very promising intervention to reduce costs and improve care of patients in isolated areas. The region can also benefit from the implementation of electronic medical records. Policymakers, however, must combine these actions with continued reform of the health care sector to ensure adequate financing, human resource allocation and coverage. Education: Increasing access to computers in schools by itself has low returns in the region. Complementary inputs are critical for ICT to have a positive impact on education, including proper hardware, software, electricity, teacher training, and technical and pedagogical support. Environment: The possible benefits ICT may generate in terms of changing environmental behaviors, environmental policy, or the environment itself are still unknown. Further studies are needed, for example, to quantify the trade-off between an increase in the use of ICT and its impact on electricity consumption and electronic waste. The use of ICT in campaigns to inspire environmentally friendly behaviors has been ineffective. Innovative uses of ICT to influence individuals’ choices—such as smart chip technology, which can make it easier to repay loans to buy natural gas vehicles—are emerging and represent a promising development to improve behaviors. Institutions: ICT can be a very useful tool to improve the quality of institutions. For the special case of Latin America, recent evidence shows that ICT are becoming an effective instrument not only to improve the efficiency of the public sector, but also to help citizens hold governments more accountable. Could information technology cause insurance companies to lose money?